Both the jog and trot are two-beat, diagonal gaits. When the right front hoof strikes the ground, the horse's left rear hoof also strikes the ground. However, if you're watching two horses in the riding ring and one is trotting and the other is jogging, you'll notice several differences between the two. The trot is a quick, two-beat gait that covers a great deal of ground at a speed of approximately 8 miles per hour. The trot is a fast, forward-moving gait. The jog is noticeable slower than the trot. Some horses almost appear to shuffle along at the trot with little hock action. 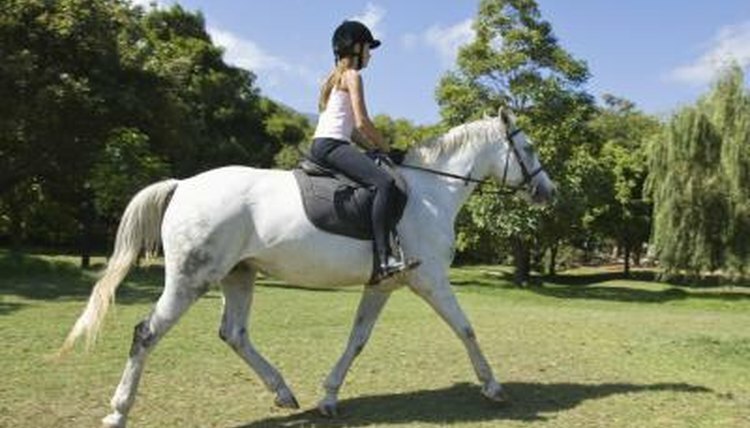 Rider position differs when a horse is jogging or trotting. At the jog, riders sit centered and still, letting their bodies absorb the motion. At the trot, the horse's motion pushes the rider up and down out of the saddle, so riders use a different riding position. Riders typically post at the trot, rising up in the stirrups and rolling onto the thighs during the upward motion of the trot, and gently sinking back down during the downward phase. Riders may also take the two-point position during the trot, rising into the stirrups and sinking down into the heels, leaning the upper body forward and holding onto the mane. Lastly, riders can also sit the trot, but the forward motion is difficult to sit to until a rider is fairly well advanced. The jog is considered a Western gait. It was developed by ranchers who wanted a slower, more comfortable gait. Since ranchers had to ride over long distances during the day to check on their herds, they wanted a slow, comfortable gait that wouldn't use up the horse's energy. The trot is considered an English-style gait. Trotting uses more of the horse's energy than the jog. Trotting is used in English-style riding tests. You'll be asked to ride a sitting and posting trot during equitation and hunt seat riding tests. In dressage tests, a collected and extended trot as well as sitting and posting trots are part of many test patterns. The jog is used in Western pleasure and other Western riding events as well as for ranch work and trail riding.